The Samsung Galaxy A20 is an April 2019 addition to the brand's Galaxy A family of budget-class and mid-range smartphones. Among its cons are a modestly-tuned dual-cluster eight-core Exynos 7884 engine running at 1.6GHz + 1.35GHz -- a lot of competing octa-core phones run on 2GHz (or faster) chips. Also, it offers no more than 32GB of native storage and it comes with only 3GB of RAM , whereas a few of its Samsung cousins offer twice as much memory and RAM. Note, though, that its support for up to 512GB of external memory was a surefire pro within the budget-tier category as of this specs-driven Phonerated review. 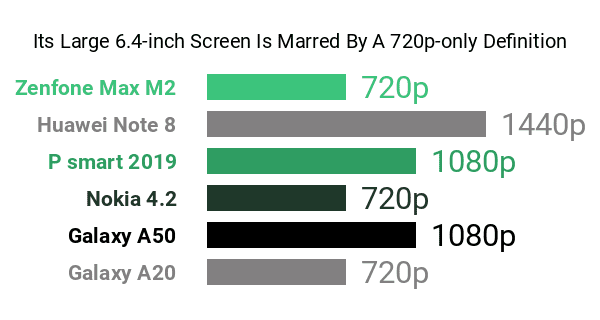 The Galaxy A20's other pros and cons are led by a wide 6.4-inch Super AMOLED screen rocking Samsung's signature Infinity-V design concept, although we cannot help but wish that it offered something more than a 720p-only HD+ (1560 x 720, to be exact) sharpness , especially since the best large-screen smartphones of its time blustered with at least 1440p displays. Sitting on its tiny screen notch is a run-of-the-mill 8-megapixel f/2.0 selfie camera. At the back, this Galaxy A model touts a dual-lens camera setup consisting of a 13-megapixel f/1.9 primary cam and a 5-megapixel ultra-wide cam whose 123-degree angle is tailored to landscape photography. Perched right under its rear cam is a typical fingerprint sensor, which works hand-in-hand with its facial recognition system for phone security. 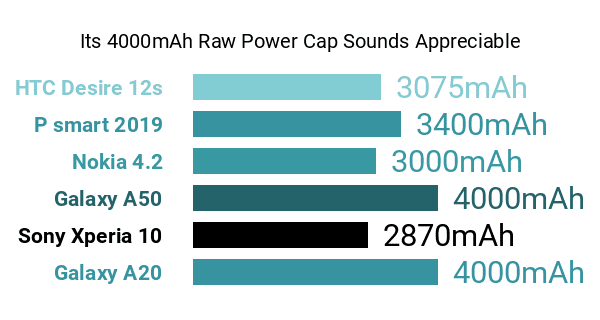 Compared to several slightly-older budget Androids from Samsung, the A20 sounds a tad generous stamina-wise, packing a 4000mAh battery cell infused with a fast-charging technology . This model also offers dual SIM card trays and it runs on Android 9.0 Pie out of the box. With a glossy plastic finish (Coral Orange and Deep Blue are among its color options) topping off its list of pros and cons, the Galaxy A20 caters to pragmatic shoppers who are in search of a wide-screen, high-stamina mid-end smartphone.